A Cafetière (aka a French Press) is a simple manual coffee brewing machine – great for fresh coffee! We’ve shortlisted the best cafetières for you to compare. A ‘cafetière à piston’, or ‘French Press’ is a simple way to brew fresh coffee. If you don’t want the fuss of an electronic coffee machine, or perhaps you just like to do things the traditional way, a cafetière is a great addition to any kitchen. Cafetières tend to be much cheaper than their modern, electronic counterparts and if you’re planning on buying your own beans, you’ll need a separate grinder for them. We’ve looked at some of the best cafetières on the market just now and made our recommendations below. What are you looking for in your cafetière? 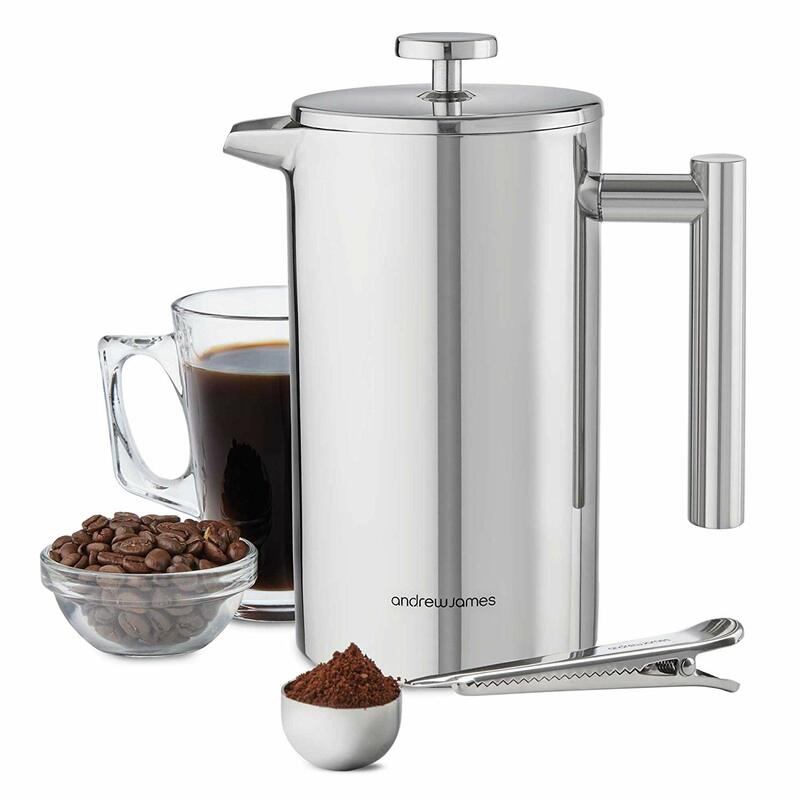 This Andrew James Cafetiere French Press comes in a cool stainless steel, it is very lightweight and easy to use. The overall look of the item would make it a welcome addition to any modern kitchen. Andrew James is a well known kitchen brand, always providing amazing products that have one of the best reputations on the market. This coffee press is no different it is very reasonably priced. The item comes with a measuring spoon and a bag sealing clip to make your coffee preparation more organised. The double walled insulation keeps your coffee hotter for longer. This means you can make a large batch in the morning and it could last for at least a couple of hours. In terms of size, this French press holds 1000ml of coffee which equates to around 6 cups. Made from stainless steel and with a luxurious silver finish, the item looks good, it’s easy to clean and is dishwasher friendly. Preparing the perfect coffee means you need to be exact which is why the product comes with a measuring spoon that also doubles up as a bag sealing clip. As you can see, this product has all the qualities necessary and is an amazing coffee press. If for some reason the item does not work or gets damaged, there is a two year manufacturer warranty on it. Life is too short not to drink great coffee so what are you waiting for? 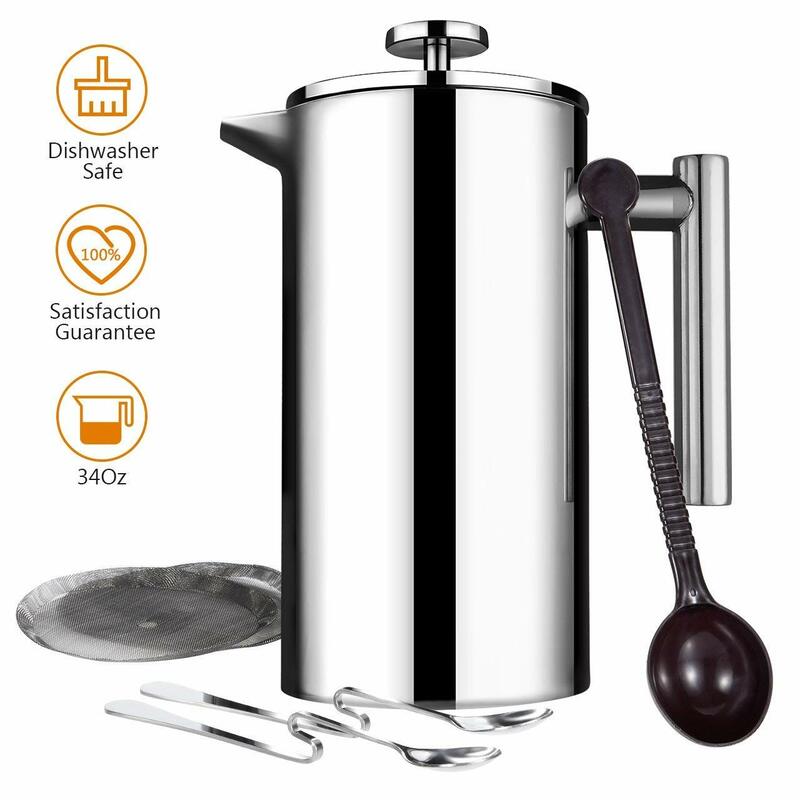 The Andrew James Cafetiere French Press is a really useful product that can help you make the perfect coffee in the morning or whenever you feel like it. If you are anything like me, you need that caffeine boost and a high quality coffee press is necessary for providing that smooth taste you love so much. The Cafe Du Chateau French Press looks really good and works even better. The 4 level filtration system goes above and beyond other coffee presses and help provide the most pure coffee you have ever tasted. The finest quality materials are used in the product, which also happen to be BPA free. The press is durable but also very easy to use even if it is your first product like this. There is a lifetime replacement guarantee with the item and that is how satisfied Cafe Du Chateau are that you will not be disappointed. The best materials possible are used in this item including durable stainless steel and thick borosilicate glass which withstands boiling water and is also scald free. With your purchase, detailed brewing instructions are also provided which is very handy. 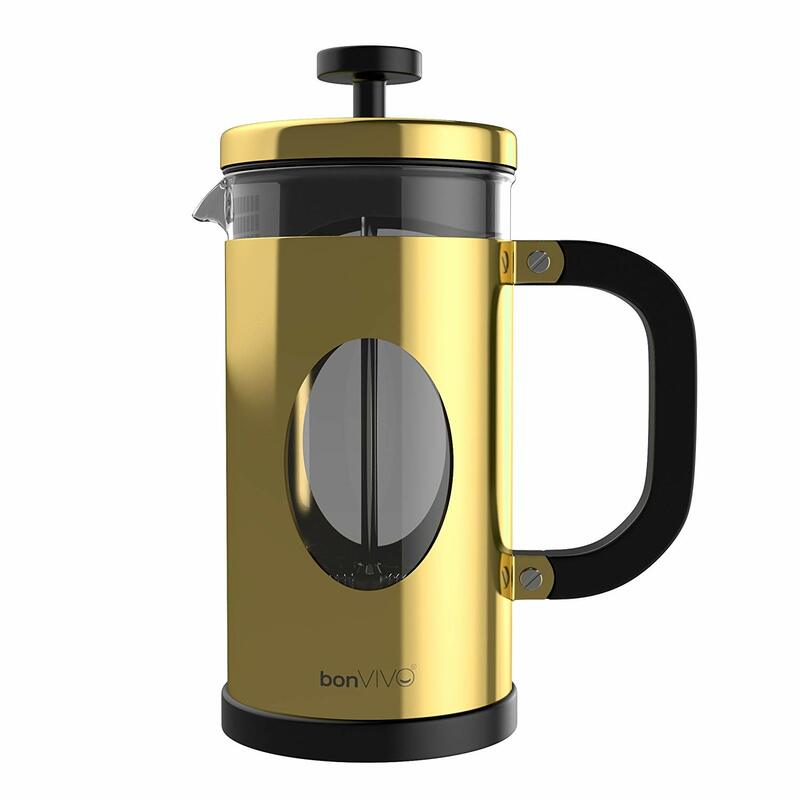 The coffee press has a really eye catching design to it, the shiny finish would make a welcome addition to any kitchen and would go well with all types of interior. There is a 4 level filtration system which means no muddy residue and helps the taste of the coffee become as pure as possible. The Cafe Du Chateau French Press is the perfect product for coffee lovers, perhaps you even want to get it for a gift for someone in your life? 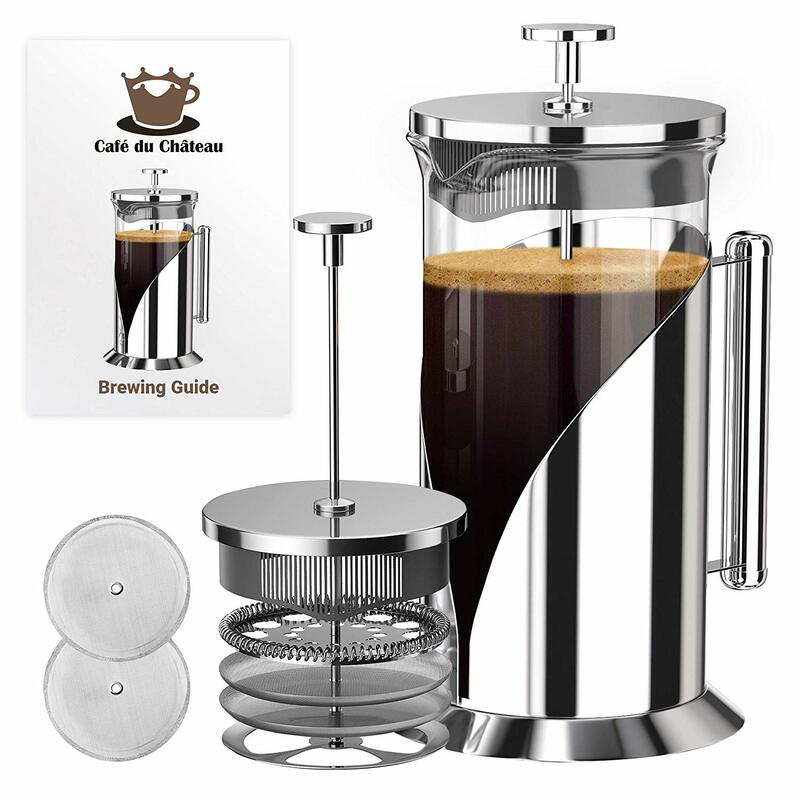 It is very high quality, it looks great and comes with a detailed brewing guide so that you can make the best coffee every single time. If you are looking for a high quality coffee press that will last you for years to come, the Cafe Du Chateau French Press is ideal. While it might be slightly more expensive than similar products on the market, it’s definitely worth the investment. This Coffee Gator Insulated French Press comes in a variety of different colours allowing you to choose what best matches your kitchen. The vacuum packed double walls keeps your brew hotter for longer. While it is slightly more expensive than similar products on the market, it is high quality and comes with a mini storage canister. Coffee Gator is a well known brand for all the right reasons and always provide quality products. The double walled vacuum packed insulation keeps your coffee piping hot. Why not make yourself a batch first thing to last you all morning long? 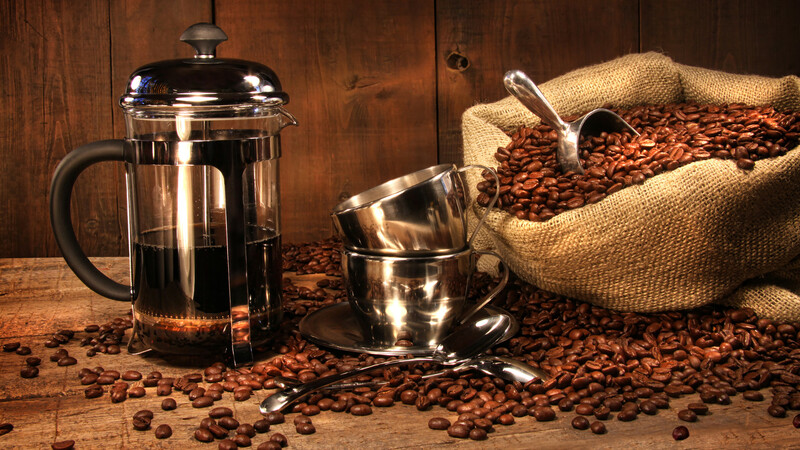 The French press is made from military grade stainless steel making it a very durable product that should last you for years to come. It is 1000ml in size, which makes around 6-8 cups of coffee depending on the size of your cups. The range of colours is very versatile and your purchase will come with a free matching storage canister for your coffee. In addition to this, the French press is packaged really well in an eye catching box. 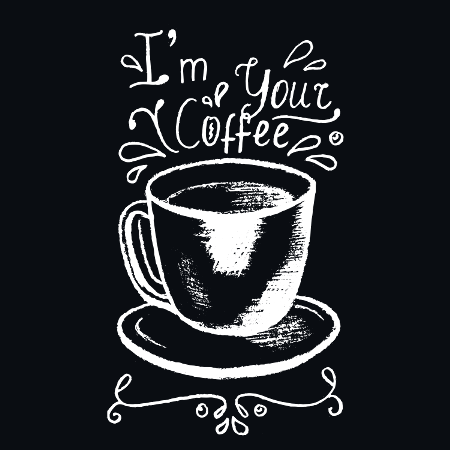 This actually makes it the perfect gift if you are shopping for a coffee lover in your life. A double filtered design is used in the product which locks in flavour and promises a rich and amazing tasting coffee. The Coffee Gator Insulated French Press looks great and comes with an accessory that provides everything you need to make great coffee at home. With positive reviews from customers all over the world, what’s stopping you from giving this item a try yourself? Make pure, rich and delicious coffee at home with the Coffee Gator Insulated French Press. This French press has an eye catching design and comes with other accessories that contribute towards this being a smart purchase. What instantly stands out about the Topelek Cafetière is the appearance. It is a cool and smooth silver, looking very stylish and modern for all kitchens. The item has a FDA and LFGD certificate, meaning it has gone through rigorous security checks and is safe to use. The press is large enough to make 8 cups of coffee, it’s lightweight and easy to use. Some freebies are thrown in with this item including a measuring scoop, 2 stainless steel mixing spoons and 3 stainless steel screens. All of this allows you to make the perfect coffee the way you want it. The design of the press itself has been well thought out and works very well. It has a double insulated vacuum wall. No matter how hot the coffee is instead, it’s fine to touch and will not scald you. The Topelek Cafetière holds 1000ml which is enough for 8 cups or 6 mugs of coffee. The entire press and all the accessories included are made from a stainless steel with a gorgeous finishing, which makes this such a stylish product. The fine mesh filters inside are ideal for making the most velvety smooth coffee you have ever tasted. If you enjoy making the freshest coffee, your kitchen needs a coffee press and the Topelek Cafetière has all the qualities necessary to deliver. It’s both stylish and functional, and as it comes with a range of accessories and an extended warranty, you can be sure it’s a great addition to your kitchen. This bonVIVO GAZETARO French Press comes in two different sizes, the larger of which is almost three times as big as the smaller one and with not much difference in price. The product has such a lovely design to it, very modern but also timeless and would look stylish in any kitchen. The plunge design makes the machine very easy to use and it also makes the most deliciously smooth coffee. The coffee press itself is made from a borosilicate glass that is heat resistant and scald proof. It is finished with a stainless steel frame with a shiny, elegant finish. The smaller bonVIVO GAZETARO French Press coffee maker holds 350ml of coffee, while the largest holds 1000ml. 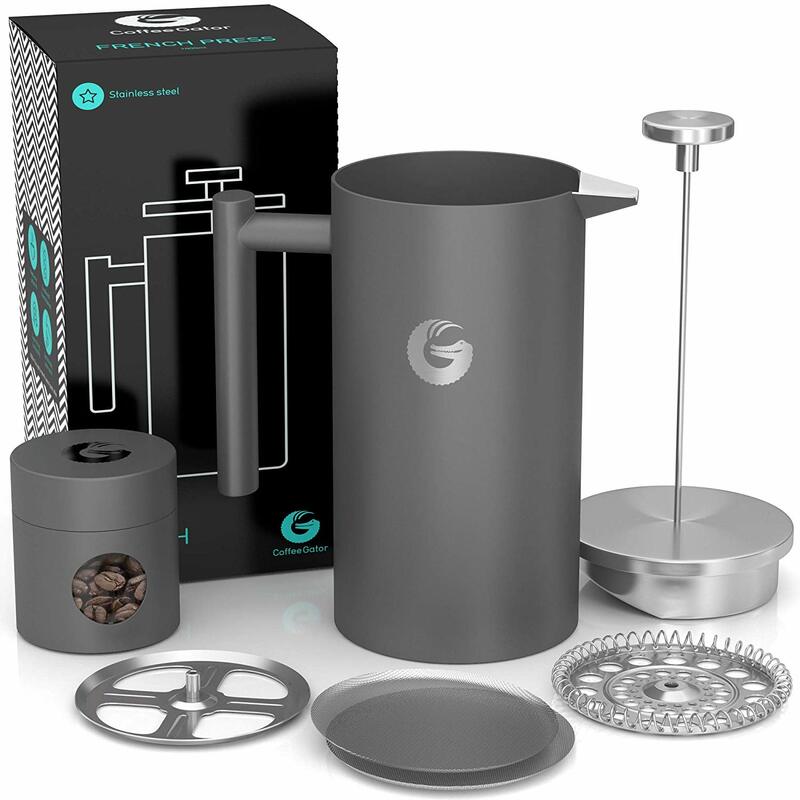 It is easy to use and the design of the product means that the water and coffee remain in contact for longer which provides a rich and full-bodied taste. With your purchase, you will also get a free coffee scoop and a replacement filter. The product looks good, it works really well, it’s a great price, it’s easy to clean and most importantly, it makes delicious coffee. If you are interested in such an item, this would be a solid choice if you want something that is affordable and reliable at the same time. If you are looking for a coffee maker that does the job well but doesn’t cost an arm and leg, look no further than the bonVIVO GAZETARO French Press. Make your coffee the way YOU deserve to with this product and have a beautifully designed French press in your kitchen at the same time.